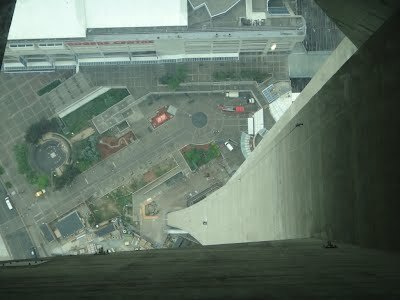 Photograph 1 - Looking through the "glass" down to ground level from the top of the CN Toronto Tower. 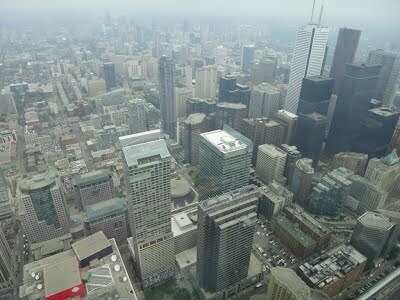 Photograph 2 - View of Toronto from the top of the CN Tower. 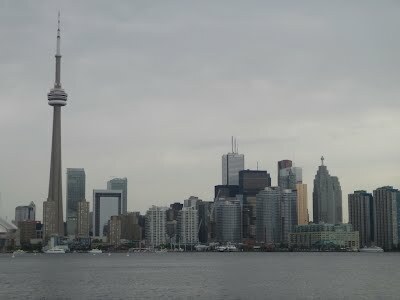 Photograph 3 - Panorama view of Toronto from the Lake Ontario boat cruise. Photograph 4 - Another "normal" view of Toronto from Lake Ontario. 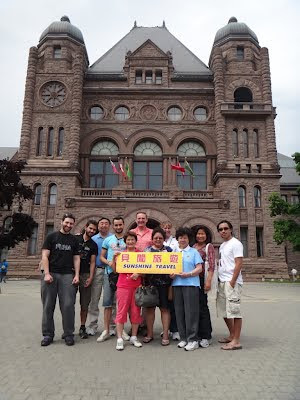 Photograph 5 - The "tour group" in front of the Old Town Hall Building, Toronto. Photograph 6 - Casa Loma Castle, Toronto - owned by Sir Henry Mill Pellatt - who's he you may ask?------------------------------------------------------------------------------------------------------------------------------------------------------------------------------------------------------------------------------------------------------------------------------------------------------------------------------------------------------------------------------------------------------------------------------Our second day of the tour and we picked the tourist bones out of Toronto. We can't say that Toronto is a great place - different - the Kanuks here do have that French influence and have different personalities compared to the Americans nearby. We climbed the worlds tallest tower - the CN tower and up on top there is a glass pathway to stand on with nothing but a five hundred plus metres drop to the ground. If one is afraid of heights, this is not the place to be. Commanding views of Toronto and Lake Ontario can be seen. Next was a boat ride around the islands of Toronto - quite pleasant just relaxing and enjoying the lakeside scene of Toronto. Next was a visit to the Old Toronto Town Hall Building. There was a pack of senior high school students who were dressed up in almost a tuxedo-style attire. It was obvious that they were wearing a selective school uniform that designates an upperclass institution. As we were taking photos of a magnificent chandelier from the entrance into the building these students were nearby, but one very assertive and weird teacher came to us and emphatically told us not to take a photo of her students - the impudence suggesting that if we wanted to take a photo of her flock was offensive needed no explanation. People around thought that this was a fine example of snobbery. It did spoil a good moment. 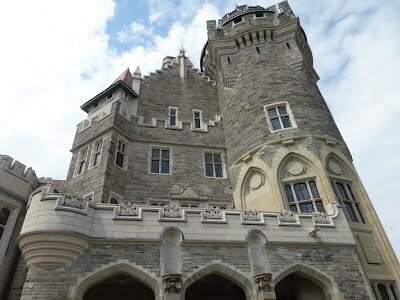 After that we visited and toured Casa Loma Castle - a structure built by a Toronto famous Major-General Sir Henry Mills Pellatt. He was a hero back in the late 1800's and early 1900's. An instigator of the hydro-electric scheme of Niagara Falls and went broke during the Great Depression. A WW1 hero and his castle exceeds the opulence one would think from a retired Army General. For dinner we travelled to a suburb of Toronto called Pacific Fair. This shopping mall was a Chinese Outlet with a Chinese Food Court - again surprise surprise! Imagine coming all this way to enjoy Chinese food in Canada!! It was a good thing because Anne found an excellent ballroom dance shop with lots and lots of dance shoes - some almost fitting her - so she'd bought a pair for $70 CND and hopefully can be made to fit when back in Oz. Tomorrow is our Niagara Falls visit and a long drive back to Boston - a 10 hour drive. So until then - cheers.